Did you learn about women in school? We didn’t either. “Each time a girl opens a book and reads a womanless history, she learns she is worth less.” This painful but true statement was written by Myra and David Sadker, in Failing at Fairness: How America’s Schools Cheat Girls. The women and men of color I learned about as a kid, I learned about by reading biographies I got from the library. I was enthralled by the stories of Clara Barton, Julia Ward Howe, Helen Keller, George Washington Carver, and more that I can’t remember. 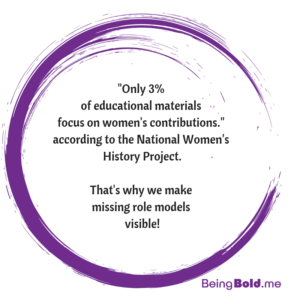 And the statistic above, that only 3% of educational materials focus on women, is really sad. So, what to do about it, as parents? One solution is to supplement what schools cover at home, by watching documentaries as a family, by taking kids to the library to find biographies, if they enjoy those, reading compilation books about people of achievement, such as Boys Who Dare to Be Different. Another strategy is to talk about it. Point out the missing women and people of color. Why are there more statues of men? When we see a statue of a man, we can talk about, who supported him? Who was in his community whose story isn’t being told? As the title of the book by Katarine Marcal asks, Who Cooked Adam Smith’s Dinner? As parents, we don’t have to have all the answers. We can help ask the questions, and look for the answers, together with our kids. Being open about it when we see unfairness in the world can be a great support to kids, it helps them understand that they’re not the only ones who realize it’s unfair. It’s validating. In the coming days, I’ll be posting more resources and books to help you and your kids learn more of these important stories of all the amazing people out there whose stories deserve to be told! Those are some of my suggestions, what do you do? Is there a favorite book that you’ve found valuable in your family? Feel free to leave a comment, thanks!